I was taking the same old route. But then there was a soft nudge. It told me “Girl, this is the same old turn! It gets you no where, Don’t give it in. And so I smirked, I winked. And I steered the other way, I drive now on the highway of Peace! P.S. 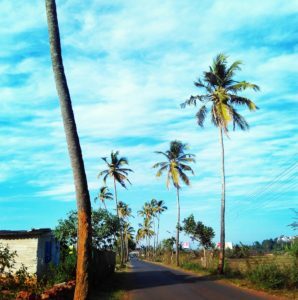 the picture is of one beautiful road in Goa I drove on recently. I saw the splendid blue sky and decided to stop my bike on a side, and capture the scene. I clicked it with my phone as carrying DSLR all the time isn’t a option, ain’t it?